Start with the cheapest scanner you can find on the market, in this particular case it was a Canon LIDE 25 for 60 Euro. The product advantage of this version is the USB processing mode which includes the power supply via USB (very useful for a portable use of the camera in conjunction with your laptop en route). This scanner works with R/G/B LEDs, which means: pulsing Light Emitting Diodes in red, green and blue. The CCD sensor chips are mounted directly on the circuit board behind a light conductor. The strip of sensitive chips has the lengths of DIN A4 (short side). Important is: The CCD chips can’t differentiate between colors. At this stage you can only take a black and white image. Remove the front glass (fixed with a lot of adhesive tape) but be careful with the scanner head. Then block the light input from the LEDs emitted between the LEDs and the light conductor. For this you will need a razor blade. Next, take scissors used to cut metal and cut out a small piece Place it close to the LEDs and fasten with glue. Close the scanner with the demounted front glass and fix it. 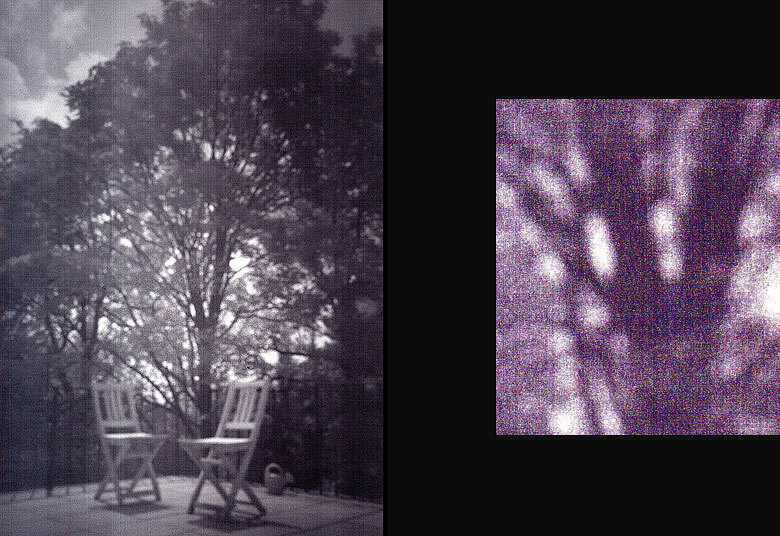 A pinhole camera reproduces an image on a projection plane. In most cases a photographic film is produced. The DigiPinHole 01 also needs a projection plane: Here I use a sheet of transparent paper mounted on the front glass. At this moment you should think about the final appearance of your camera. I had the task of sending the camera from Germany to Japan by mail. I found a practical aluminum box (used several times before) and decided to reduce the transport weight by using the transport package as the camera „body“. But every light-proof box with the required dimensions can be used. Place the scanner inside your box and fix the device properly. Connect the scanner to your computer. Everything is now ready to take the first photo. It is important to remember the following: Every scanner runs a test program before scanning. The scanner, therefore, needs brightness on the CCD chips. It is necessary to open the pinhole camera during the test modus! Consider an appropriate way of taking the USB cable out of the box (light-proof) and your camera is ready. Sure, we need a hole! Use a portable drill and drill a 5mm hole. With punching scissors you can make the final hole in light-proof and thin paper board (because of the relative huge image plane you don’t need a very small hole: 2-3mm is perfect). 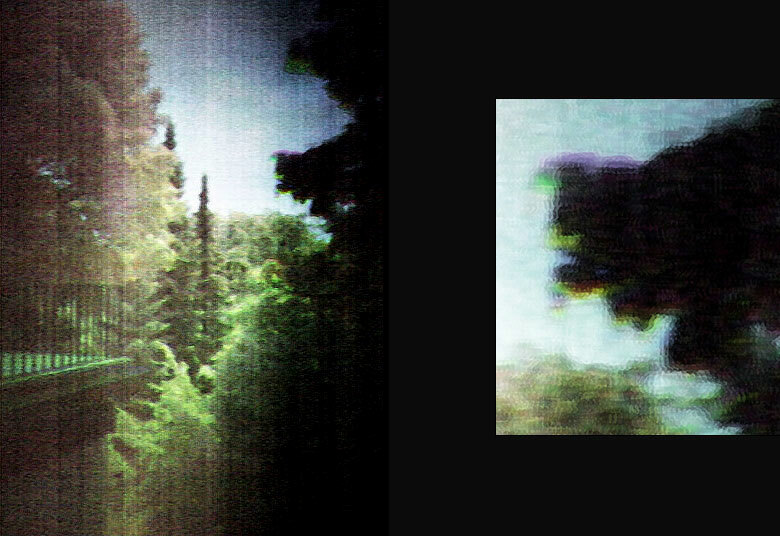 From now on, Photoshop is your darkroom. With a lot of effects and tricks you can edit your scans and make them look better = use contrast, tonal value or soft-focus effect. The following is amazing: Thanks to the digital process you can merge two or more scans into one image. This means that you are able to generate a long term exposure made of several scans taken during the daytime. Brand new is the creation of color images made of three scans, using color filters (red, green, blue) in front of the hole. As during the use of other pinhole cameras, you need a lot of light and a liking for blurriness but taking a photo with the DigiPinHole and editing effects is real fun!